Speaking after his permanent signing from Gateshead, Adam Wrightson gave his thoughts on Blyth Spartans and the atmosphere in the squad at the moment. “I’m very happy to be here. It’s somewhere new and that brings a new challenge. There’s no better place and obviously it’s nice to be playing games. “The atmosphere in the squad is fantastic, everyone is very upbeat. The results from other teams are going our way as well. 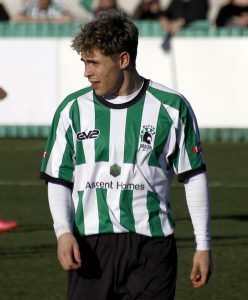 Fellow new boy Shaun MacDonald also had his say on joining Blyth and his initial thoughts on the club. “Personally, I’d like to get some games under my belt and prove myself. For the club, it’s great to be looking at going up a league to then be testing ourselves against bigger teams who are full time. It’s better for everyone involved with the club to be playing against clubs that may have a higher profile. ← Blyth Spartans Juniors have 3 teams in Cup Finals!